This beautiful and scrumptious Green Ginger Dragon Fruit Smoothie Bowl has a creamy and luscious texture and a delightfully fruity flavor with a touch of ginger kick! Vegan, gluten-free, refreshing, healthy, and easy to make, too! I've recently fallen in love with smoothie bowls. Smoothie bowls can make you feel like you're indulging in the most decadent of desserts but with zero guilt! 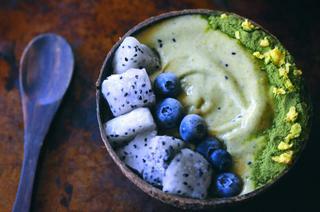 This Green Dragon Smoothie Bowl (as I like to call it) absolutely knocked my socks off. The flavors are remarkablycomplementary! There is a bit of tropical fruitiness balanced with subtly sweet and spicy ginger; and then throw in a bit of green superfood powder and bam -- you have one ridiculously delicious, creamy, healthy smoothie bowl that isn't too shabby in the looks department either. Using a high speed blender or food processor combine all of the above ingredients.Blend until completely smooth, light, and fluffy -- about five minutes.Scoop into a bowl, top, and enjoy! YOUR SUPER Super Green Mix.